It’s easy to develop a remarkable web design to showcase the latest Apple product. Ok, not easy, but easier than developing a remarkable website for a plumber or an office supply company. The difference is the product. When the product itself is remarkable, the design follows. 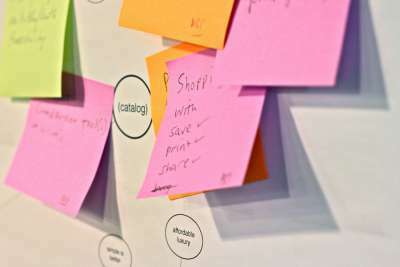 But most web design projects don’t involve remarkable products. We live in the real world, where designing just another law firm website is the norm. So how can you bring good design to the websites you’re working on where the product offering seems a little lack-luster? I’ve searched the web and come across quite a few websites that got it right – these are my top 7. 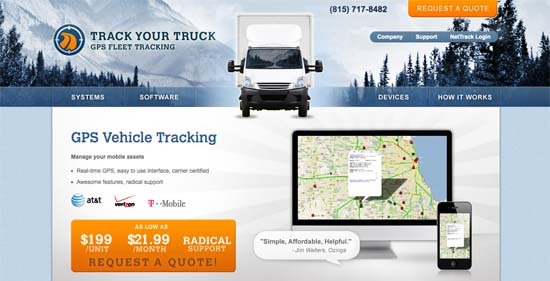 Track Your Truck is a website promoting GPS vehicle tracking solutions. This isn’t the most exciting product or service to advertise. Instead of picturing the actual device (which might be boring), the design employs imagery and icons that speak to the benefits you’ll receive from the product. It’s this kind of creative thinking that has the ability to transform boring content into beautiful, effective design. 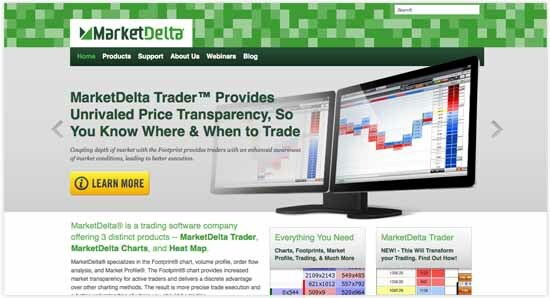 Market Delta is a trading software company. Their software provides charts and technical information about market trading. Since the product is so technical, the website mainly focuses on headlines describing the benefits the product provides with just a few snapshots of the program in action in the background. Nocella Roofing is a U.S. East Coast roofing company. Rather than using images of actual roofs they’ve put on, which might be a little dull, the site uses creative copy writing and illustrations to convey the feeling you will have if you don’t get your roof fixed! They’re focusing on the feeling and benefit you’ll receive rather than the actual product and service. Re:consider is an innovative cleaning solution company that promotes a more sustainable way to clean. Their concept is exciting, but cleaning solution is still cleaning solution. Their site is minimal and well done – you can shop, learn more about the company, and learn about their products. 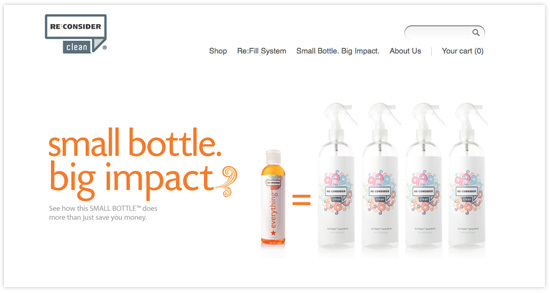 The site appeals to the sustainability of the product rather than just selling the cleaning solution. Bounty’s newly redesigned site features a lot of visual content and opportunity for interactivity. It features promotions, cleaning tips and even activities for kids. Bounty has a very recognizable, strong brand that this design centers around. Dow Chemical Company’s website is designed around their principles of innovation, sustainability and community. You’ll have to look pretty deep to find any images of the actual products Dow produces. Focusing the design on these positive aspects of the company helps them seem more approachable and softens the negative image often associated with chemical and oil products. 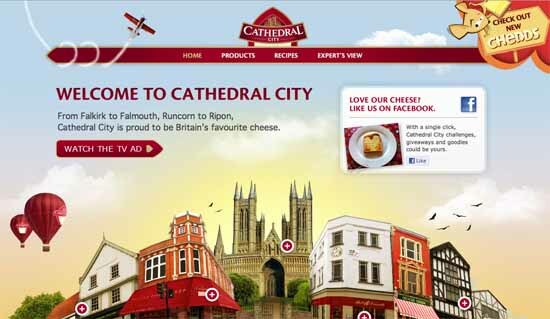 Cathedral City is a UK based cheese company. While they do have photos of cheese on the site, their cheese products are not the main focus. The website focuses on the Cathedral City brand as well as recipes that can be made using their cheese products – which speak to the benefits their products provide. All of these websites focus on something other than the actual product or service they’re trying to sell. Why? Because the product is not what is remarkable about the offering. When your product isn’t exciting, this is a good direction to take. Think about what is remarkable about what your selling. Is it the benefit the consumer will receive or the feeling they’ll get when using your product? Does it appeal to a trendy sentiment like sustainability? Maybe the brand has a fun identity you can focus on. 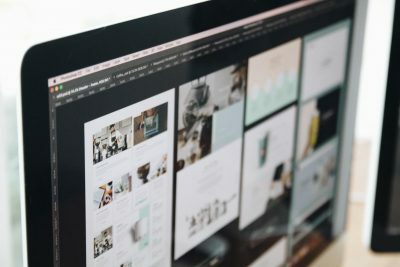 Focusing on these aspects in the design of the website will help you bring good design to even the most boring products. These websites went above and beyond the product to position the website in a more eye-catching way. Know of any other websites that transformed boring content into a beautiful design? 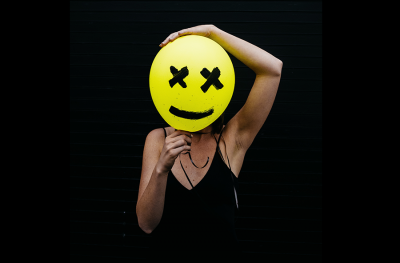 Have your own tactics for promoting boring products? Send me a message or leave a comment!